At the height of his celebrity for Left-wing incendiarism, Ken Livingstone sounded an alarm that echoed around the world. There were in our city, he warned, “paramilitary groups which resemble fascist organisations.” It was 1984, a date laden with portent. The IRA was active, as were Hitler-worshipping elements of the National Front. What had Ken discovered? Nothing more terrifying, it seemed, than the Board of Deputies of British Jews. It was they who were putting together the “paramilitaries,” Ken said. In a tirade against the deputies made in an interview with an Israeli newspaper, he claimed the board had been taken over by the extreme Right wing and, he alleged, the venerable institution was being run by reactionaries and near-fascists. As troubled Londoners scanned the streets in vain for cohorts of fascistic Jewish paramilitaries, Ken – not for the first time – began to look rather silly. And the total lack of evidence, then or now, to support his warning invited a question: why did he launch into such a bizarre outburst? Many Jews in London think they know. Ken, they say, hates us. It seems a startling proposition, and yet Ken acknowledges there is a problem. “I’ve had 25 years of demonisation and being denounced as anti-Semitic,” he told the website somethingjewish.com in 2005. So is Ken the victim of a smear campaign (his favourite bunker when under attack) or does he really have an anti-Semitic instinct? The question has never been more important as London prepares to vote in the mayoral election. Indeed, the issue of Ken and the Jews arose at an Evening Standard-sponsored debate on 25 February when a member of the audience accused Ken of making divisive remarks. How can London stay ahead as a great world city, Ken was asked, with a Mayor who says things like Israel should not have been created? Ken did not reply directly but he said a former Chief Rabbi had himself stated that maybe it would have been better if Israel had never come into being. Ken has said this before, on a number of occasions. He says he is quoting an interview with Lord Jakobovits in the Evening Standard, just before he retired as Chief Rabbi in 1991. In reality, Lord Jakobovits said no such thing. He was critical of Israel’s policy towards the Arabs but he did not say the state should not have been created. For a man with Ken’s powers of recall, not to mention a vast army of researchers, this seems odd. Would he deliberately misquote Lord Jakobovits in order to make some kind of a point? If so, what point is he trying to make? Similarly, what was in Ken’s mind when he said of wealthy property developers the Reuben brothers, Jews who were born in India: “Why don’t they go back to Iran and try their luck with the Ayatollahs?” The brothers had upset the Mayor over their handling of a deal on a site for the Olympics. He publicly questioned their former business activities in Russia and for some his remark, so redolent of get-back-to-where-you-came-from language, smacked of anti-Semitism. So, too, did his encounter in 2005 with Oliver Finegold, the Evening Standard reporter who, on asking Ken a perfectly civil question, found himself being asked if he were a Nazi war criminal. When he told Ken he was Jewish, Ken compared him to a Nazi concentration camp guard. The affair ended with Ken being suspended from office for four weeks, later overturned by the High Court. To this day, he has refused to apologise. The episodes with Finegold and the Reuben brothers, and many other incidents over the years, have helped reinforce a perception that Ken has a down on the Jews. Although suspicions about Ken’s attitude extended beyond the Jewish community and its understandable sensitivities, it was a sense rather than a prosecution case for anti-Semitism. Where, a fair-minded person might ask, was the evidence? Professor Geoffrey Alderman is an historian, acknowledged for his expertise on Jews in Britain. He is the author or co-author of 12 books, including London Jewry and London Politics, 1889-1986. He said: “The final chapter of that book is about the civil war between Ken Livingstone and London Jewry. Of course Ken has a problem with Jews. Look at the things he has said over the years. It’s all documented. I am an evidence-based historian and the facts cannot be denied. They lead to an inescapable conclusion. Professor Alderman says the evidence against Ken is in the history. Go back, he said, to the beginning. Ken’s political career started as a London councillor in the 1970s, but he came to prominence only after seizing control of the Labour group at the GLC when it won the election of 1981. Ken’s leadership of the GLC was a triumph or a travesty, depending on who you ask, and few periods in London’s modern political history have been more written-about and discussed. Less well-rehearsed is Ken’s shadowy relationship with the Workers’ Revolutionary Party. The WRP is often associated with Vanessa Redgrave, the actress, because of the support she and her actor brother, Corin, gave it. But it was led by Gerry Healy, a bully and sexual predator who was accused of coercing women party members into “cruel and systematic debauchery,” as one of his alleged victims put it. When Healy died in 1989, Ken spoke at his funeral. He said the then defunct WRP (and by association, Healy) had been the casualties of an MI5 operation “because they believed it (the party) was becoming too pivotal in terms of domestic policies.” This produced derisive laughter among serious figures on the Left. Ken was being silly again. The WRP was a ragbag of factionalism and back-stabbing that imploded under the pressure of its own ineffectuality. The publicity it received because of the Redgrave connection and Healy’s cavortings certainly raised its profile, but not in a sense that gave it political relevance. That is not to say MI5 was uninterested. There is evidence to show that during the early 1980s the WRP received money from two dictators about whom Britain had grave suspicions: Colonel Gaddafi of Libya and Saddam Hussein of Iraq. The WRP, in return, spied on alleged enemies of these regimes based in Britain. The party also peddled a virulent anti-Israel and anti-Zionist – some would say anti-Semitic – message through its daily newspaper, News Line. Ken Livingstone was with them every step of the way. He was an editor of Labour Herald, a soft-Left paper many suspected of supporting Trotskyite entryism into the Labour Party. The paper was printed by a firm based in Runcorn, Cheshire, which also printed News Line and publications sponsored by the Libyan government. When Private Eye ran a piece claiming Ken Livingstone, then leader of the GLC, was editing a paper financed by the Libyans he successfully sued for libel. It has to be remembered that at that time Gaddafi was encouraging the assassination of his political opponents abroad and wiping them out at home. In 1984 his thugs fired on demonstrators outside the Libyan embassy in St James’s Square, killing WPC Yvonne Fletcher. Although no one doubts Gaddafi was subsidising News Line and Labour Herald there is absolutely no evidence Ken knew about it. But he did support the WRP when it published an extraordinary anti-Jewish rant in News Line. On 20 March 1983, BBC2 ran an investigation on its Money Programme. Its central thesis was that the WRP’s newspaper, Ken’s Labour Herald and other publications were being funded by Gaddafi. Looking at the transcript today one sees a thorough, rather measured, piece of journalism. The response was quite different. Under the heading The Zionist Connection, News Line published an editorial denouncing the Money Programme’s investigation. It blamed a “powerful Zionist connection” that ran through the Labour Left, Mrs Thatcher’s government, to the BBC. It cited the placing of Stuart Young, a director of the Jewish Chronicle, as chairman of the corporation and the appointment of his brother, David Young, to head the Manpower Services Commission. The Jewish Chronicle, the editorial noted, gave “support and advance publicity” to the Money Programme. On the day of its hysterical editorial News Line ran a piece in which Ken suggested the Money Programme report was indeed the work of Zionists. In the same piece he blamed “smears” against him on agents working for Israeli prime minister Menachem Begin’s government. 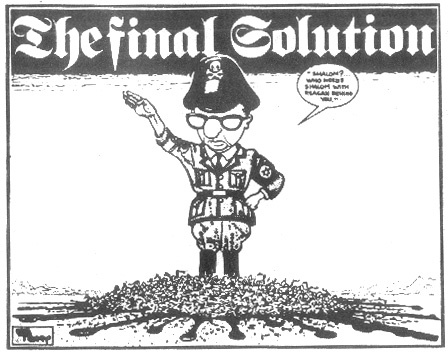 Interestingly, Ken’s Labour Herald ran a cartoon depicting Begin in the uniform of an SS officer, making the Nazi salute. Some might imagine this was inspired by precisely the same mindset that led to Ken calling Oliver Finegold a Nazi concentration camp guard. After the News Line tirade, Ken was tackled about anti-Semitism by Sean Matgamna, the Trotskyite theorist and an iconic figure on the Left. Matgamna, now in his mid-sixties, was one of the WRP’s most severe critics. He told me: “The WRP ceased to be a political organisation and was merely a group paid for by Islamic regimes. They were spying on dissident Arabs and Jews for Gaddafi and Saddam, here in London. There is a view that Ken has been trapped into an apparent anti-Jewish position because of the leanings of the Left-wing milieu from which his political power grew and, more recently, because he has courted London’s large Muslim vote. That would certainly fit in with what we know of a man whose generosity of spirit is occasionally overwhelmed by his pragmatism. In his memorandum to an all-party parliamentary inquiry into anti-Semitism, Ken catalogued the efforts he has made for London’s Jews during his tenure as mayor, including promotion of Jewish festivals and encouraging wider education about London’s Jewish community. After the Oliver Finegold episode, a number of leading Jews in London decided something had to be done. In December 2006 a new body, designed to act as an interface between the Jewish community and the Mayor’s office was launched as the London Jewish Forum. Since then the group has worked with Ken on a number of issues. Of course, this was just Ken being silly again. Wasn’t it?